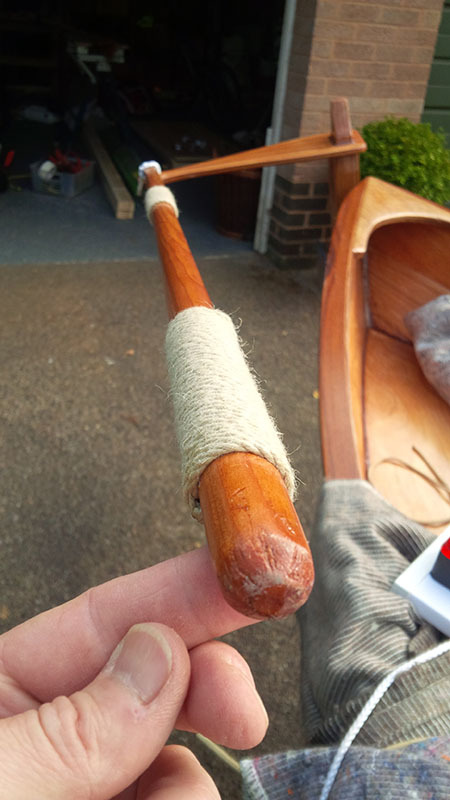 The hole and knot idea works really well and may well be the strongest solution but it has the disadvantage that it cannot be removed quickly when you are underway and, you are right, it does not look as classy as a bit of brass. Well it's been a while since I have done anything on the boat. We decided that braving the winter weather was not ideal for Saffron's first outing, I have been waiting patiently for the spring. A lovely job. Looking forward to seeing it under sail. Saffron has now been out on the water a couple of times to test rigging and try to iron out a few crinkles. Test 1 last weekened was moderately successful in very light airs and threw up a moderate 'to do' list - non of which I have had the chance to address before we went out today. She handled herself very well under sail and I felt comfortable alone in the boat at the helm. The major issue today was that the rudder popper out - twice. On the first occasion I managed to fix her back in under way, but on the second occasion with the local Exe pleasure steamer bearing down on us, the manly thing to do was to dowse the sail and water the oars and head for shore. This threw up several issues, the first of which was that I was very glad that I have a balanced lug rig instead of the stock sprit sail. A quick un-tying of the halyard and the sail was in the boat. I am not sure how I would have managed that with the sprit sail is short order. The second point is that I was mighty glad to have the oars with me. It may sound silly, but in my short sailing career I have only seen one other dinghy with a set of oars aboard. Madness not to on a fast flowing estuary like the Exe here in Devon. The third point is that I really need to find a solution to ensure that the rudder does not pop off again. I have read about this issue with other Skerry owners and of course the supplied kit did come with a stopper to prevent this happening, but the stopper (an "L" shaped piece of aluminum to fix above one of the rudder fittings) was too small for the task so I did not fit it. The water was choppier today than on my first outing and clearly this meant the rudder just popped off the pintels (gudgeons?). With no transom there is little space to screw in the sort of simple rudder clip that is fitted to a mirror or a tideway, so I am going to make a bungee clip up at the chandlery. I hope this will work. The other things I need to do urgently are to replace the rope fixing (shown in the plans) between the tiller and the rudder with a more secure fixing. The plans show shock chord, where I have used some normal line which does not tie off a s securely. Despite several turns around the tiller, under strain when the rudder popper out the tiller came loose from the rudder stock and made streerage difficult. Then plans show a pin arrangement, but I am going to try the shock chord first. The other big learning points from today. - fix some sort of net to box in the boats to stow loose items - including the anchor which is liable to flap about and devil me paintwork! 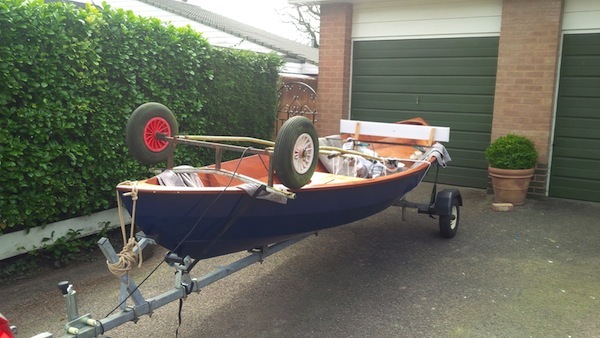 - some deck eyes about the gunwales would be handy, especially for securing the oars in flight and for fenders which are also in the car! 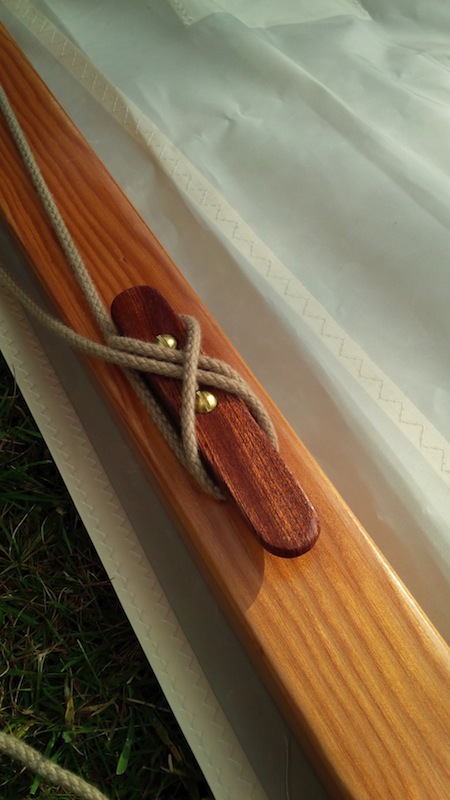 - binding for the mast/spars to avoid flogging. - a burgee for a top the mast. Knowing where the wind is is very handy it seems! Lots to do....lots to learn! Some of the minor repairs have been implemented, but I still have to finish wading through my to do list. Using shock chord on the tiller seemed to work fine. The shock chord - because it is stretchy I suppose - ties off better to the tiller extension arm and yesterday we sailed for an hour without a hitch. The burgee atop the the mast is a no-brainer and worked brilliantly to day. I also solve the 'rudder popping out' problem with a simple bungee loop fixed to a plastic hook over the top pintel. We sailed today and the rudder was secure. I have also fixed some bungee (shock chord) to the drop rudder to pull it down, but the cunning plan is that the rudder will be able to move if we ever hit an obstruction. I have also drilled a 5mm hole 6 inches below the water line in the rudder extension and fitted a line running back up to the rudder top. This allows me to haul the drop rudder up for coming ashore. Both modifications are fitted to tub jam cleats which makes them easy adjust under way. Works a treat - and will share photos soon. However, my one problem today was that the screws on the top gudgeon have popped out. I have fixed the to gudgeon as per the plans, but it is only held by 6mm ply (laminated with glass tape at that point, but it is not sufficient to bear the load. It also requires drilling into the aft bouyancy tank, which I was nervous of at the time. My plan now is to move the top gudgeon above the line of the aft seat and add an internal block inside the stern, this will make a much stronger fixing for the top gudgeon. Annoying that these running repairs are required so early into Saffron's life, but that's boating! OK all is well and the rudder gudgeon is, for the moment at least fixed. The issue was that I had not used long enough fixings and with new fixings in place the top gudgeon seems to be very solid. Finger's crossed and all that. 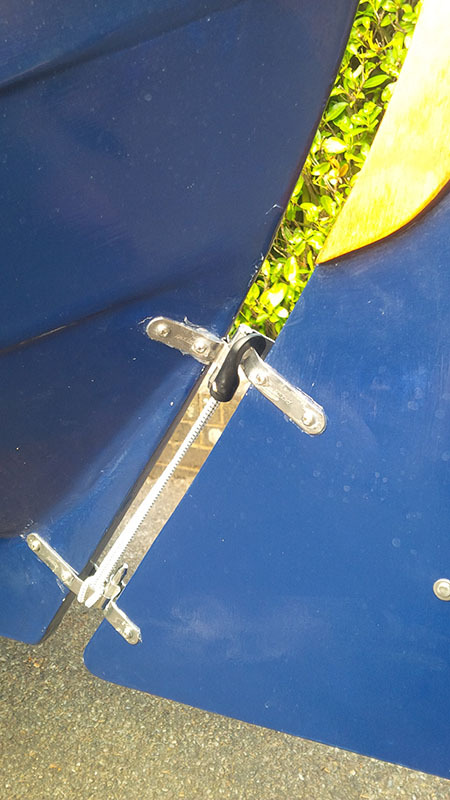 I thought I'd also share some pics of other mods made to the rudder that add functionality, some security and quirky style. Firstly I have added another line to the rudder drop blade to allow me to haul it up when coming ashore and also for launching from shallow water. The line is fitted to a small locking shackle through a hole about six inches below the pivot point. The line could just as easily be tied off to the blade direct. The drop blade is hauled down under way by a 5mm bungee which can be tensioned further running to a jaunty brass jam cleat. The second innovation, to stop the rudder popping when under way is a loop of bungee fitted with a plastic hook. Standard stuff from the chandlers in Exmouth. Works a treat. Much more handy than any retaining pin I reckon as it allows me to unhook it quickly when under way in the even that I need to dowse the sail and row. Rowing with the rudder in position is pretty much impossible I have found unless you have a deck hand handy to take the tiller - or frankly to do the rowing. 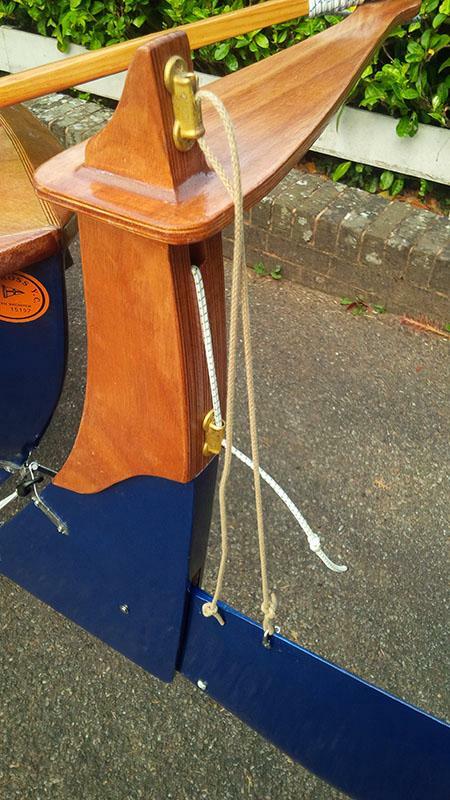 My final idea was to bind the tiller in two places with some synthetic 3mm twine. Firstly to provide better grip on a damp day at the end and secondly where the tiller tends to rub the rails when the yoke/rudder is pushed to port. The rudder yoke pivots down when put to port and this tends to make the tiller bash the paintwork! I am hoping to use this method to bind the boom and possibly the yard to stop the mast getting a bashing when we are hooting along. Back in the water this weekend after a spell in dry dock! Goofing off today - don't tell the boss! 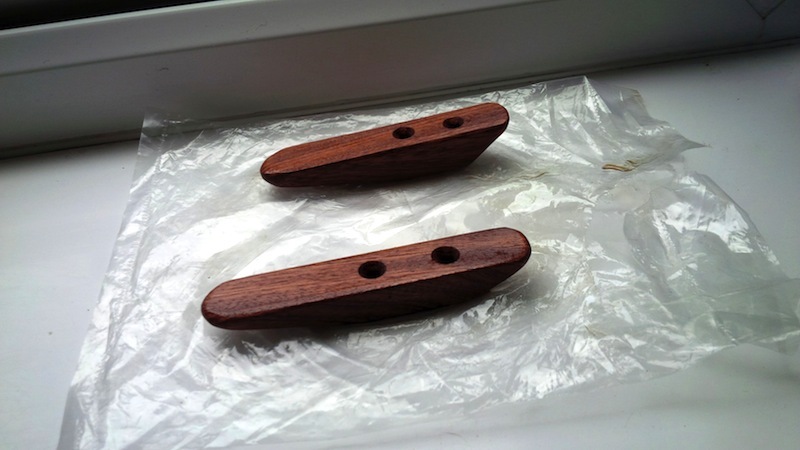 Made some Jam Cleats out of left over scraps from the mahogany for the rails. The idea is that these will be nifty for my sail reefing lines. At the moment I am just winding the reefing lines round the end of the boom and tying them off, fine for setting up the reef, but less easy to undo. Hopefully these puppies will be more useful. Each one took about 15 minutes to make with the belt sander and some fine paper to finsh them off. I am planning to make another, slightly larger one for the main sheet if this works. You will note that they are an imperfect pair...but they look pretty jaunty when installed...!